The Millennium City and Millennium Tower is a combination of modern shopping malls, multi-screen cinemas, apartments and office buildings of the kind that you find in most big cities these days; it was built in 1999 in an attempt to fake that Vienna is a metropolis. The Millennium City is a chunk of late 20th century consumer culture and can be found in the 20th district or Brigittenau. It was designed by architects around Gustav Peichl. The Millennium City occupies 38,500 square metres of space in seven floors, surrounding a central courtyard of 2,500 square metres, the so-called "Millennium Plaza" with direct access to the Millennium Brücke ("Millennium Bridge", as you might have guessed it). To me, the entire Milennium City is ugly like hell, lacks any personality whatsoever and is a shame to every self-respecting city - yet, it is a rather successful enterprise and manages to keep the proletarians of the city happy, fed and entertained. The Millennium Tower is 171 metres high if you measure the highest office, but even 202 metres high if you include the funny tip on the roof. This makes the Millennium Tower the highest office building in Vienna and one of the very few actual skyscrapers of Austria - a country usually relying on mountains when it comes to altitude records. The Millennium Tower has 50 floors equalling some 47,200 square metres of space, of which most is used for offices. Only some 9,000 square metres are used for the multi-screen cinema and public areas of the shopping mall. The Millennium Tower was built very quickly, as the managing company is pleased to underline: At a rate of approximately 2.5 floors a week on average; thus, it was finished even before the millennium ended in 1999. Today, there are approximately 120 tenants in the Millennium Tower that rent office space there. At the turn of the Millennium, Vienna benefited a lot from its role as Europe′s gateway to the east; a position that now slowly wears off. Prices for offices have not increased a lot after 2005, but when the Millennium Tower opened, several multinational companies opened their "Eastern Europe" section there. The original owner of the Millennium Tower, Georg Stumpf, was smart enough to sell it at the perfect moment: In 2003, the Millennium Tower was sold to a German real estate company for 360 million Euros - the construction cost had been 145 million Euros. The price that was paid is equivalent to 15 times of the annual income that is generated with the Millennium Tower. 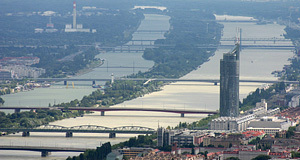 Attractions nearby are essentially not existent; however, there is a subway station right next to the Millennium City and the Donauinsel is close (so is the Danube, obviously). To learn more about the 20th district, please read my article on the Brigittenau. Personally, I think the only reason to go there as a tourist is for cheap food or some unchallenging entertainment at the multi-screen cinema.